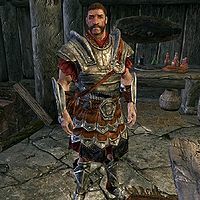 Legate Skulnar is a Nord soldier who can be found in the Jarl's Longhouse in Falkreath if the Imperials control Falkreath hold, at the Falkreath Imperial Camp if the Stormcloaks control the hold. Skulnar is clad in a set of Imperial heavy armor. This includes an Imperial armor, a pair of Imperial bracers, and a pair of Imperial boots. He is equipped with an Imperial sword for close-range combat, and uses an Imperial bow supplemented with 13 steel arrows when the need arises. He also carries a steel dagger. This page was last modified on 30 December 2013, at 13:25.